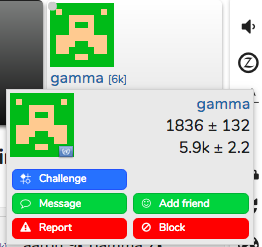 I think it’s worth mentioning that one of the small changes recently rolled out is that the Game History table on your profile now shows the rank that you were when you finished that game. This is truly awesome. I didn’t implement that, I’m just letting you know it’s there. Yeah - tee hee indeed! It turns out that the information was all there already, it seems, just waiting to be displayed. dragon96 was a genius for finding it sitting there and showing it to us - an 8 line change in the code for someone who knew what they were doing! Thanks a lot. It’s very appreciated. As a frequent correspondance player, I would like to know also the rank that we were when we started a game. Some games take weeks or even months to complete and meanwhile rank can change a lot. As an example, if I remember correctly, when this game started two months and a half ago, I was 9k and my opponent was 14k or so. Sometimes I notice it and wonder where I could retrieve that information. Looking at the rank chart is not so straightforward. The infobox shows current rank for both players (actually there are link to each one of them). But I think it’s not so necessary to have links in the infobox, provided that they are already available in the game page. Maybe, if the information is available, this could be the right place to show it: all other contents of the infobox are related to the very beginning of the game. Do you think it’s feasible? The ranks you had when you started the game are displayed in the top right - in this case ? and ? . jk it just takes a while to load. You were 11k and 12k respectively. You were 11k and 12k respectively. That’s not what I recall. I wasn’t 12k two months ago: I’m falling down. My opponent instead is rising. 11 vs 12 was a picture taken this morning. Now it’s 10 vs 12. I see in the top right my actual rank, not the older one . This calls for an investigation, I will present results shortly. In about 2 months. For example, in the game that @lysnew linked, you can see their ranks from when they said hi at the start of the game from the chat log (9k and 14k), which are different from their current ranks (12k and 10k at time of writing). 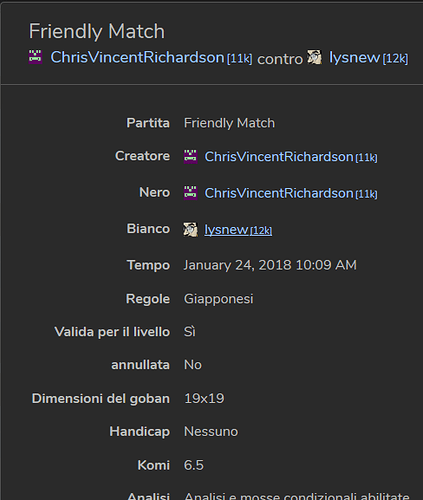 @lysnew It looks like in this issue tracker  that the ranks are intended to display your rank at the end of the game, so your rank in the correspondence game should update as you play other games. I think it makes sense to display the rank at the beginning of the game, but I’m wondering if either you or @anoek know why the feature request was for the end of the game as opposed to the beginning. I’m guessing it’s because people want to know the effect of that game on their rank. Interestingly, we’d really need to be able to see the actual rank (with decimal and uncertainty) to be answering this question properly. @dragon96 do you know if that too is available, and we could display it with a mouse over popup? Currently, if you play + finish a game, it looks like the displayed rank in the top right is the last rank you had before the game finished, so it doesn’t show how the game affects your rank either. Because to meet @smurph’s goal of being able to see the effect of the game on your rank this is what you really need. I thought of another question: is the number that we get (that you gave us in the history table) updated as the rank is recomputed, or is it just the first post-game rank that was calculated? Suppose I started games A, B, C in that order, and I finish B, A, C in that order. If my rank goes from 10k --(B)–> 9k --(A)–> 8k --©–> 7k, then the game history table entry for games A,B,C will show 9k, 10k, and 8k. But the history table shows the games in finished-order doesn’t it, not started order? In which case, this is correct: it shows the effect of each game, as it finishes, on our rank. Is the full rank information available to show? Does this information get updated as our rank is updated over time (I mean the update that is not due to us finishing games, but instead due to our opponent finishing other games)? I’ve just done some testing, and I think that the numbers we are getting in the history table are in fact before the end of the game, or at least, before the ranks are applied after the end of the game. In that screenshot you can see that TestGaj was 14k (in fact, 13.4k) before his last game started. After his last game, his rank dropped to 15k. The History Table shows TestGaj’s rank associated with that game as 14k. 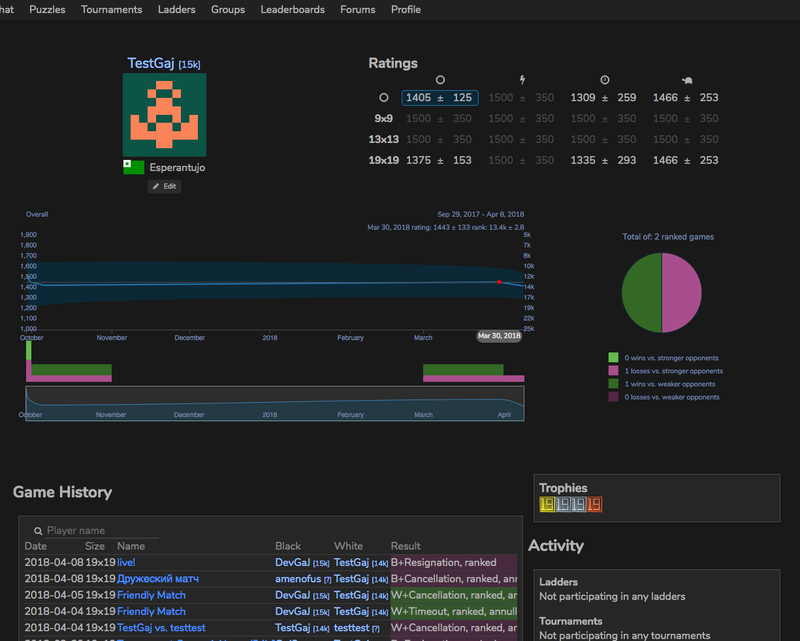 This is a splendid improvement to the server, but It isn’t entirely consistent in application. 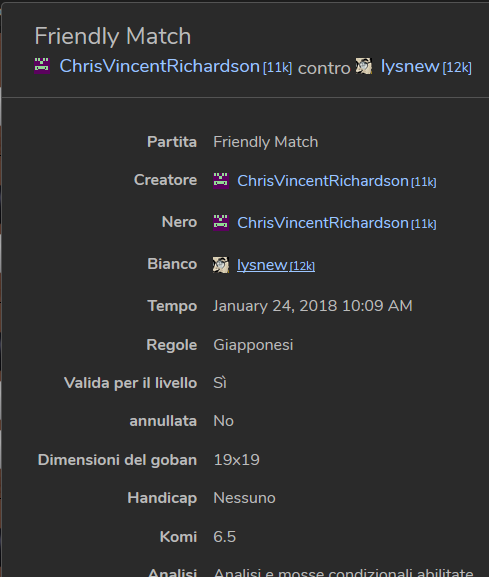 In one of my games (from more than a year ago), it shows current ranks, with me as 8k and my opponent as 19k; in fact, I was 18k and my opponent was 16k at the time. Perhaps the difference has something to do with pre-Glicko vs. Glicko-era games. @Conrad_Melville I looked through your games history, and assuming that  is the game you’re talking about, it’s quite possible that your rating then would be estimated as 8k now. It looks like you won your first 3 games and  was your fourth. Ah, yes, I see what you’re saying, and I think you are right. 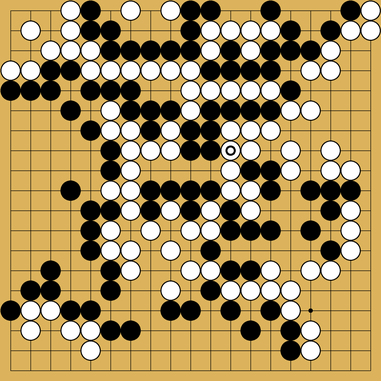 At the time, games against bots were not counted until the bot reached some ridiculous number of games, but now they are counted, and, as you say, it appears that they made the rank calculation retroactively for that game. Thank you for claifying this.